China is going through one of its periodic financial crises, so this series of book reviews and essays by John Reilly seems appropriate. While I am skeptical about Gordon Chang's predictions of China's collapse [Chang is a Hedgehog in Isaiah Berlin and Philip Tetlock's terminology], eventually, it seems like events will probably eventually catch up with his predictions. Fundamentally, the Chinese financial system seems like the kind of thing that works until it doesn't. It is just really hard to know when that is going to happen. 2011 John Wiley & Sons (Asia) Pte. Ltd.
Famously, in 2001, the investment analyst Gordon Chang published a book entitled The Coming Collapse of China. 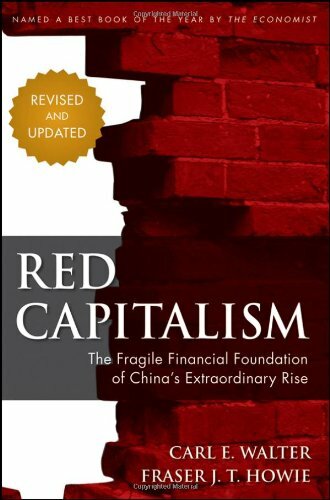 Though by no means disparaging of the great progress that China had made since the beginning of Deng Xiaoping's reforms in the 1970s, the book dwelt on the fundamentally diseconomic nature of the country's State Owned Enterprises (SOEs) and on the hilarity that is the Chinese banking system. It also made many pointed comments to the effect that the Chinese Communist Party had become an essentially parasitic caste about which the Chinese people would eventually ask, "What have you done for us lately?" He suggested that the system would implode around 2006. By that time, he surmised, the transparency demanded by the World Trade Organization, which the regime imprudently insisted on joining, would reveal the phantasmal nature of the Party's attempt to maintain a communist-capitalist hybrid. Now come Carl E. Walker and Fraser J. T. Howie, an investment banker and a financial writer respectively, with many years of experience in and around China. In effect, they seek to explain why China remains uncollapsed a good five years after Mr. Chang's doomsday date, though that is not quite how they put it; they do not even cite the earlier book. They wax effusive at times in their praise of the benefits that the People's Republic has brought and on the statesmanship of certain of its leaders. Indeed, their admiration for Zhu Rongji, premier from March 1998 to March 2003, is so complete that they sometimes seem like partisans in the bureaucratic battles they describe, particularly the struggle of the central bank, the People's Bank of China, against those fiends at the Ministry of Finance. The authors usually venture only subdued suggestions about the kind of event that might cause a crisis of the system. Their presentation is prosaic and detailed in a way that only an accountant could love, but it does make a very strong argument that China's sterling economic growth statistics by no means imply that China should be regarded as an inviting investment opportunity. Quite the opposite: terms like "debt," "capital," "stock," and "contingent liability" do not mean in China what they mean in the rest of the world. Economic China is a great cloud of unknowing, a region of financial opacity that will not grow less opaque as long as the Party remains in power. The proof of this is that, during and after the financial crisis of 2008, China was the dog that did not bark. Any earlier economic Great Power in the midst of its expansive phase would have used such an event as an opportunity to buy up the suddenly cheap assets that littered the world's economic landscape. China did no such thing, beyond one or two modest overseas acquisitions. Not only did financial capital not flow out of China; neither did intellectual capital. Though the Chinese increasingly like to boast that they have devised an economic system that is different from and maybe better than that of the developed world, the fact is that their system cannot be exported. The issue is whether it is sustainable domestically. The authors point out that the development of China has not been a smooth upward glide after the end of the Maoist era. There have been bubbles, panics, and periods of serious inflation. The banking system has collapsed at the end of the 1970s, 1980s, and 1990s. The Tiananmen Square incident of 1989 was only the social expression of a period of monetary mismanagement. Indeed, the authors argue that the reforms that had been attempted earlier were essentially negated at the end of the first decade of the 21st century. At that time, the banks were directed to make an astronomically large aggregate of infrastructure loans, mostly to local governments through shell organizations, to make up for the sudden decline in the export market. The loans look solid only because they are new. In reality, there is no obvious way they can provide income streams to pay themselves off. These practices simply repeat the post-Maoist pattern, and they are exactly what Gordon Chang was talking about. There are four big government banks, as well as lesser institutions. Banks do operate conventionally, especially when they deal with the outside world. However, the Big Four, either directly or through other institutions acting at their behest, ensure that the financing for the key elements of the economy takes the form of loans made on the basis of politics rather than of economic calculation. These are made principally to SOEs that are under no particular pressure to pay their arrears, much less to pay on time. The result is that the banks fill up with nonperforming assets that have to be disposed of periodically. They can be written off, or their repayment can be delayed into a future when the incumbent administrators will not be responsible for them. In the first step, the [People's Bank of China, which is the central bank and not one of the Big Four] reduced by fiat the deposit-reserve ratio imposed on the banks, from 13 percent to eight percent. This move freed up RMB270 billion in deposit reserves which were then used on behalf of each bank to acquire a Special Purpose Treasury Bond of the same value issued by the [Ministry of Finance]. In the second step, the MOF took the bond proceeds and lent them to the banks as capital . . . This washing of RMB270 billion through the MOF in effect made the banks' depositors -- both consumer and corporate -- de facto shareholders, but without their knowledge or attribution of rights. Premier Zhu's strategy was to make a clean break with the past by actually writing off the bad debt. That would allow the purged banks to take in real money, in contrast to fiat capital from the central bank or the Ministry of Finance, through IPOs and debt offerings to foreigners and to genuine entrepreneurs at home. This would not only provide a market-based reality check for the economy as a whole; it would also allow Chinese banks to develop world-class levels of expertise, which they in turn would be able to offer to the Chinese government's own financial regulators. The authors remark several times that the hopes for the import of foreign expertise were realized. The financial system of China today was built largely with the advice and enthusiastic collaboration of Goldman-Sachs and other institutions that they authors do not seem to realize have become names of ill omen. However, the crucial features of the premier's reconstruction strategy were not realized. The result was that Chinese finance became an artist's conception of a modern system, overlaying a mechanism that combined elements of the Soviet and feudal systems. Premier Zhu's intent was to deal with the nonperforming assets by creating entities like the Resolution Trust Corporation (RTC). That institution was how the United States managed the savings-and-loan crisis. The RTC took on all the assets of the saving-and-loan institutions that had failed and whose depositors' had been paid off by federal deposit insurance. The assets were sold for whatever the market would offer. To most people's surprise, the RTC broke even. Encouraged by this success, the Chinese created one such "bad bank" for each of the Big Four banks. The idea was that the assets would be sold at a discount and the banks would then close. For bureaucratic reasons, however, these things did not happen. The values of the bad assets were never written down, and the bad banks were not closed. They have gone through various transformations over the years, but their worthless assets are still somewhere in the financial system, and are still marked at full value. The banks are actually the feature of the Chinese financial system that most closely resemble their developed-world counterparts. The other two major components, the bond market and the stock market, are idiosyncratic institutions that could not interface with the wider world even if the government were inclined to let them try. The interest rates on bonds are decided politically, as are the identities of the enterprises that can sell them; the matter has little to do with risk assessment by the lenders and underwriters. In any case, bond rates are not much higher than the derisory rates offered by bank accounts. Businesses acquire bonds to conform to some official policy, not as genuine investments. The situation is a bit different with stocks. Along with real-estate speculation, stocks are the only way to better the return on bank interest rates. However, the actual ownership of the entities represented by the securities that are traded with such enthusiasm in the Chinese stock markets is never really at issue. The entities are SOEs, for the most part. This means that they are national property, if not quite the People's Property anymore. In any case, the price of stocks is not determined by estimates of the profitability of the SOEs. Prices rise in response to real or perceived changes in state policy, particularly monetary policy. All the retail stockowners are pure speculators; there are no "natural investors" in China, in the sense of people who invest for the long term. The long term is a political matter. Not much of the real capital in the system comes from the stock speculators, of course. The basis of the system is what the authors call the "heroic savings rate" of the Chinese people. For the most part, there really is no place to put most of one's money except in the banks, even if the real interest rates are negative. Those savings support whatever real growth occurs in the system. However, this arrangement is predicated on a population that is overwhelmingly of working age and is little inclined to spend. This is one of the few contexts in which the authors allow themselves to sound apocalyptic. The fact is that the one-child policy means that the population is becoming quickly and dramatically older, and older people who cannot work have to spend. For the moment, though, the authors say that the Party has arranged China in a way that is very satisfactory to itself and not intolerable to the population as a whole. The country does have a real market economy, principally in a few great urban agglomerations on the eastern coast. These are a source of foreign capital and expertise; at the same time, the arrangement allows the Party to insulate its beloved Inner Economy of SOEs and parastatals from all global events except commodity shortages. This arrangement is not so different from the state of things during the latter Qing Dynasty, when Treaty Ports were a feature of the coast but the interior of China was less affected by foreign influence. We might note some historical parallels that the authors did not mention. Today's debates within the Party about the desirability of state direction versus market forces is somewhat reminiscent about the debates during the Ming Dynasty about whether the Yellow River should be accommodated in a wide bed defined by dikes (the cheap, small government solution) or dredged deeply (the dirigiste favorite). An even better fit is the argument during the Former Han about whether the state's salt and iron mines should be privatized. In any case, the Party is interested in the market economy only to the extent that it affects the Inner Economy. Readers will note the resemblance between the Inner Economy and the "commanding heights" to which Lenin alluded when he defended his New Economic Policy against the charge that the private enterprise it allowed was a form of counter-revolutionary backsliding. Essentially, Lenin argued that, as long as heavy industry and the utilities remained public property, then the economy remained socialist, no matter how many private traders there were. The rulers of China seem to be of similar mind. The greatest irony in all this, the authors remind us more than once, is that China is now ruled by an oligarchy of old revolutionary families. This development was facilitated by a bureaucratic shuffle that occurred in connection with a reform of the SOEs. These had once been governed by state institutions, according to the Soviet command-economy model. The controlling bodies had been headed by persons who held ministerial rank, generally as vice-ministers, and often a place on the Politburo, if only as alternate members. In China, these controlling institutions were closed down, theoretically in the interest of economic freedom. Their place was taken by regulatory agencies with much less authority. The vice-ministers and politburo members, however, simply became the heads of the enterprises they had formerly overseen, while maintaining their positions in the state and Party. It is interesting to note that the Big Four banks did not benefit from this process of the old political bosses taking direct control. The Big Four and the financial system in general are subject to the state in a way that SOEs are not. That follows the Soviet pattern, too, which subordinated banks as mere payment systems. Also conforming to the Soviet model is the way the classical Communist era was wound up. The oligarchs of the Russian Federation were essentially Soviet economic ministers who had contrived to walk off with the assets of their old ministries. Pretty much the same thing happened in China, but with notably greater tact. In a way, the picture of China in Red Capitalism is even more disconcerting than that in The Coming Collapse of China. The latter book at least gave a clear picture of where the faults in the system were and when they could be expected to express themselves. In Red Capitalism, however, the authors suggest that the direction of the Chinese economy is no less wrong-headed, but the system successfully masks the fact. They end the book by likening the Chinese financial system to the layout of the Forbidden City. That complex is a maze of courtyards and narrow corridors designed to frustrate the line-of-sight on the ground, so that only people in the upper stories have a clear view of the whole. Readers may suspect this model to be too optimistic, however. If China really is as the authors describe, then no one, least of all the people in charge, knows what is really happening. This has never been a formula for success.